The orca whale, also known as killer whale, is powerful and beautiful. Its name in Latin, Orcinus orca, means Greek God of the Underworld. It is the largest species in the dolphin family. Below are more interesting orca whale facts. Male orcas are typically 19-26 feet in length and can weigh in excess of 6 tons. Females are about 16-23 feet in length and weigh about 3-4 tons. The largest orca whale on record is a 32 foot long male weighing over an amazing 10 tons. The orca whale is black and white in color. Their flippers are paddle-shaped and the dorsal fin on their back is straight on males and curved on females and immature males. Orca whales have powerful jaws with teeth up to 4 inches long and they have a blowhole near the top of their head which they breathe through when above the water surface. Orca whales can be found living in all oceans and most seas, including the cold Arctic waters and the warm tropical seas. They are often seen off the west coast of Canada and the United States. Orcas do not migrate with seasonal changes but they will sometimes travel hundreds of miles to find seasonal prey. In the wild, orca whales are typically not a threat to humans. However, those in captivity have been known to attack and kill. Orcas are very social creatures. They live in pods (groups), consisting of 5-30 whales. The bond between them are strong and last a lifetime. They hunt together, share their food, and protect the vulnerable, including the young, sick, and injured. Pods are lead by females. Orca whales, like dolphins, communicate and hunt using echolocation. The sounds they produce travel underwater until it bounces off an object, thus revealing the size, shape, and location of the object. Each pod of whales have their own distinct sounds so they are able to recognize one another. 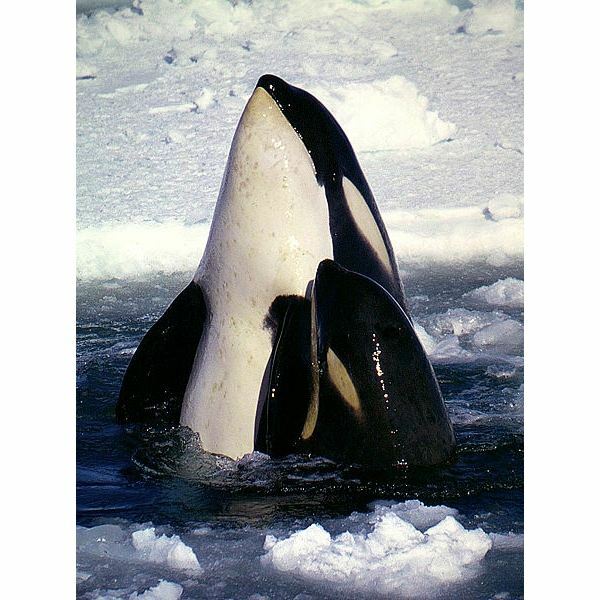 The female orca is usually mature by the age of 15 years. She can give birth at any time of the year and will normally give birth to a single offspring. On average, a female will give birth 5 times throughout her life. The gestation period can last up to 18 months. The baby orca is born tail first and instinctively swims to the surface (with the help of mom) to take its first breath. The average newborn is 6-8 feet in length and weighs about 400 pounds. 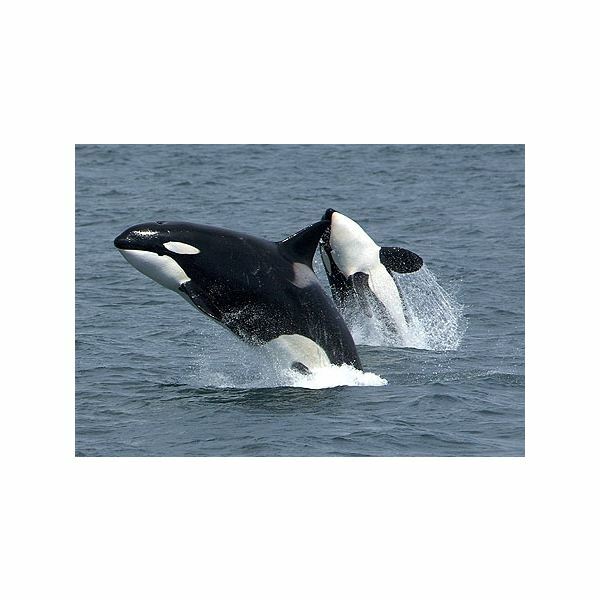 The orca whale feeds on a variety of animals, including fish, seals, sea lions, walruses, turtles, squid, octopuses, penguins, sea gulls, sharks, and other whales. An average-sized orca can eat about 500 pounds of food a day. • Males live about 30 years and females about 50 years. Some may live up to 60-80 years. In captivity, they live about 25 years. • Scientists discovered mother and baby orca whales (and dolphins) do not sleep for a few months after the baby is born. • Recent research shows orca whales are one of the most contaminated marine mammals from pollution. This can hurt their health and their ability to reproduce. • These beautiful whales are not yet regarded as an endangered species.